Barn [with patches and a lean-to] in the field, posted by Matt Niebuhr. Found – neither wanting or asking for attention. That is what I am after in these shots. 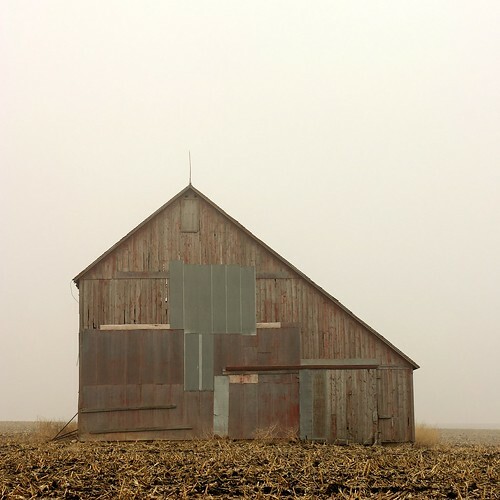 The “stoic” life of a barn – strong, accepting of conditions, fully the result of utility. Yet, conditions are changing – purpose is shifting. This entry was posted in Documentary, Matt Niebuhr - Photography, Photography and tagged barn, Matt Niebuhr, Photography by Matt Niebuhr - West Branch Studio. Bookmark the permalink. I love the crisp textures…paired with the creamy, wispy fog it makes for a wonderful image.